Monday to Friday – 8:30 to 17:00 After hours by appointment, please don’t hesitate to call. Saturday – 09:00 to 13:00 – After hours by appointment, please don’t hesitate to call. Sunday – By appointment. We are happy to meet you or set a time for collection or delivery of goods, kindly call us to arrange a time. Corner of Wellington and Elliot Street, Howick, East Auckland, customer entrance in Wellington Street. 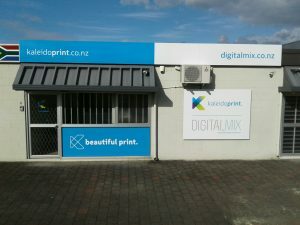 Look for the Digital Mix / Kaleidoprint signage, that’s us! Tanya Edwards – Financial Director / General enquiries. Do you want us to arrange collection of your tapes? Call us to arrange for our courier to collect your tapes. Pick up address, day time address with someone present. Goods must be packed and correctly labelled. Please include all you contact details and a return address. We use Courier Post NZ for our collections and deliveries, we cannot assume any responsibility for the couriers. Courier charges will be added to the final invoice.